254 pages | 59 B/W Illus. 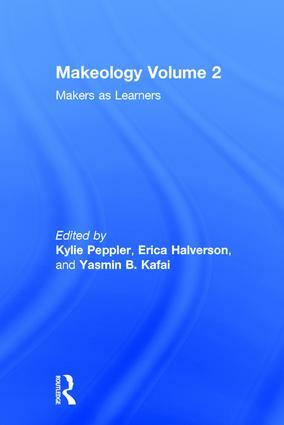 "The Maker Movement promises a revolution in education that the Makeology volumes beautifully describe. Adults and children work together to develop designs and products they can be proud of, involving science, technology, engineering, and the arts. This is the kind of collaborative education that helps people develop identities as lifelong learners and producers." "Makeology is the first broad and comprehensive examination of the Maker Movement as a catalytic force for young people's learning. Practitioners and scholars interested in implementing and studying making as a force for creative expression and student-centered learning will find in this two-volume collection a wealth of thoughtful and significant information." "This second volume offers a window into the biggest promise of the Maker Movement—to give children agency and meaning in their own learning. As a potentially transformative practice and field of scholarship, Makeology has the opportunity to catalyze the attention of researchers, teachers, school administrators, parents, curriculum developers, and policy makers because the authors offer insights into the ways one can begin to study, model, and understand these phenomena of learning." "One thing we have in common is our commitment to putting more power in the hands of people from all backgrounds, enabling everyone to develop their voice and express themselves. There’s a special opportunity right now. But that moment could also slip away, so it is all the more important to make connections and join forces with other communities with shared values, to make sure that all children have the opportunity to grow up as full and active participants in tomorrow’s society." Kylie Peppler is Associate Professor of Learning Sciences at Indiana University. An artist by training, she engages in research that focuses on the intersection of arts, media, new technologies, and informal learning. Her current work focuses on maker culture. Erica Rosenfeld Halverson is Associate Professor of Digital Media and Literacy in the Department of Curriculum & Instruction at the University of Wisconsin-Madison. Her work focuses on what it means to learn in and through the arts across a range of contexts including out-of-school arts organizations, museums, libraries, and arts-based classrooms. Yasmin B. Kafai is Professor of Learning Sciences at the University of Pennsylvania. She is a researcher and developer of tools, communities, and materials to promote computational participation, crafting, and creativity across K-16.